YellowAirplane.com: A Flying Fish Photo in the South China Sea. 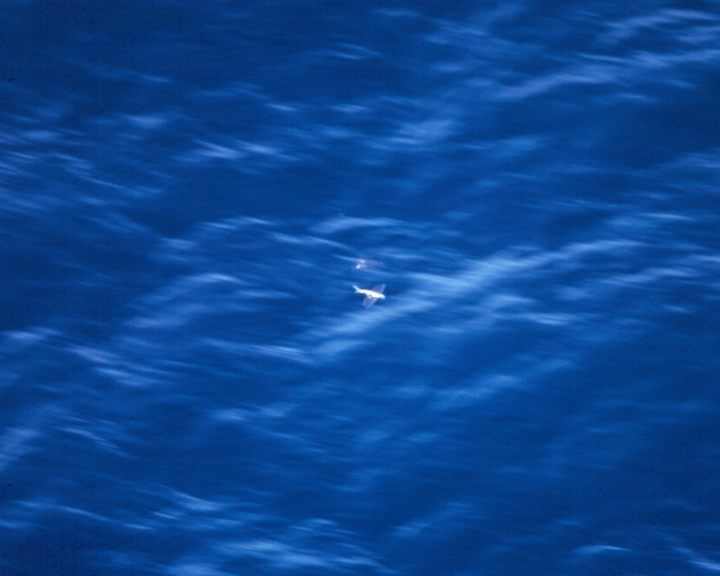 A Flying Fish photo in the South China Sea. There are more flying fish than any other kind of fish, at least that's the way it seemed. When you went out onto the sponson and watched the water. Every few seconds you saw a flying fish jumping from wave to wave. I must have wasted, and I mean wasted, several rolls of film trying to get a close-up photo of a flying fish. You needed a spotter to help you locate the fish. He would yell, "There's one to your left." Maybe, since we were in the Navy he should have used the word, "Port" instead of left and it would have been easier to get the picture. Just kidding! The flying fish would jump out of the waves sometimes two or three at a time. They wouldn't really fly by flapping their wings, they would just use the peak of a wave to assist their jump into the air. The fish would glide for a long way just above the water, then they would fold their wings and swim like a fish. I bet they thought they were like Jonathan Seagull by trying to see who could stay in the air the longest. In this photo, you can see another flying fish just below the water right next to the flying fish in the air. Look at these other USS Kitty Hawk Exhibits. To See All Exhibits in the Yellow Airplane Online Museum, Click Here.